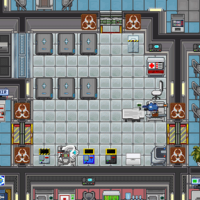 Located conveniently next to the cloning lab and right across the corridor from robotics, this place has been specifically designed to preserve and store dead bodies so they will stay fresh for forensic analysis into the cause of death, cloning them back to full health or, failing that, cutting out their brains and putting those into cyborgs. So naturally, bodies are left to rot where they fell, or right on top of the cloning scanner for extra irony. A set of disposal pipes connects this room directly to the Chapel Crematorium, so that any dearly departed that end up here can be given a proper burial further abused for a macabre farce. This room has no air-vents. It's air is supplied via the medical corridor from the vents connected to Starboard Emergency Air Hookup. 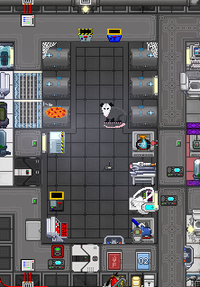 This APC in this room is located on the sternward wall, next to the MedTrak computer. The power is supplied via a cable through starboard maintenance via cloning. 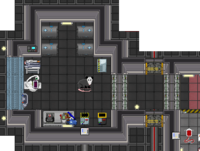 The station has two morgues, one east of medbay for quick disposal of those unable to be saved by the combined efforts of the doctors, roboticists and geneticists, and one southwest of the chapel. Both morgues are connected by disposals pipes for the chaplain's convenience, which might give you hope that sometime, somewhere, a funeral may actually take place. Morty the possum makes his home here. He's a sensitive but resilient sort of guy, try not to scream around him. There is no vent. Luckily, opossums don't need air. Neither do corpses. The APC for this room is in the top right corner, near the crate of "Spare Parts". 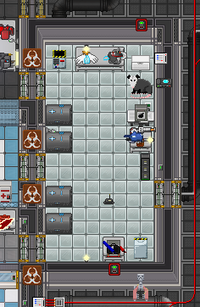 The Morgue is located towards the southwest of Medbay,at the end of the corridor and right next door to the cloning lab. This room is designated for those unable to be saved by the combined efforts of the doctors, roboticists and/or geneticists, and includes several Morgue Units and formaldehyde to preserve bodies for forensic analysis. Morty the possum makes his home here. He's a sensitive but resilient sort of guy, try not to scream around him because of all the corpses. 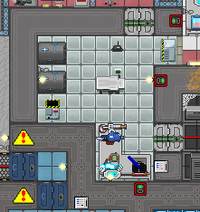 The Morgue is located towards the south of Medbay, at the end of the corridor and right next door to the cloning lab and robotics lab. This room is designated for those unable to be saved by the combined efforts of the doctors, roboticists and/or geneticists, and includes several Morgue Units and formaldehyde to preserve bodies for forensic analysis. 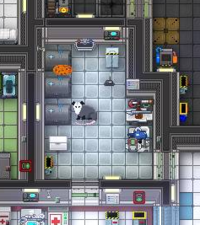 In addition, due the clinical atmosphere of cleanliness and the general tendency of most (but not all) crew to avoid places where corpses are kept for extensive periods of time, this place makes a great place to eat and store the pet possums of highly-tensive red-haired Medical Directors. Hence, the pizza and Morty. The Morgue is where all the people and things that get sent through those grey morgue chutes in the Operating Theatre, Medbay lobby, and the Chapel Crematorium end up. In theory, this room and its morgue units are supposed to used to store bodies of those who couldn't be revived by cloning, cyborg conversion, and/or re-animation. In practice though, a body is simply a terrible thing to waste, so instead those useless corpses are often harvested for novelty robot parts, processed into man-meat, and/or reclaimed for cloning biomatter. Genetic's monkey pen is also above this room. While it's somewhat inconvenient for the geneticists, it does help ensure that they are in fact actually checking (or at looking through) this place for corpses to clone. There is no vent. Good thing corpses don't have smells. The APC for this room is in the maintenance tunnel above. On Mushroom Station, the Morgue has been forcefully assimilated into Genetics. Poor Morty couldn't do anything about it. It's still accessible by Medbay and Security staff, as well as the Janitor, but Geneticists can readily access it from their lab, while everyone else has to go through the maint tunnel around Robotics to get it. Some people like their donuts glazed. Some like them frosted, with plenty of sprinkles for good measure. Others enjoy them filled; still others enjoy them knotted. Everyone in this asylum enjoys these fried confections in their own way, but absolutely none (well...) enjoy them with dead bodies. That's why there's a room in the northern parts of Medbay called the Morgue, dedicated entirely to storing dead bodies away from the crew. But it's not just for storing dead bodies; it's also for preserving and analyzing them for crime scene investigation (or something like that). Hence, all these surgical tools, bottles of embalming fluids, forensic scanners, and the adorable local Virginia opossum, Morty. There is no vent. Good thing these corpses don't smell. And can't smell for that matter. The APC for this room is on the southern wall, behind the disposal chute. Let the bodies hit the floor; it's the Morgue! Theoretically, like a real morgue, this little corner bellow Medbay's inner pharmacy area is supposed to be used to preserve bodies for autopsies and forensics; hence, the morgue units, surgical equipment, bottles of embalming fluid, mortician's suit, and forensic scanner. In practice, however, most of the forensics work happens before the body gets sent here, leaving the body at the mercy of the Medical staff. Sometimes, they're pretty tame. One of the Medical Doctors might just take it to cloning or attempt to heal the body up for some re-animation. Or a Roboticist might take the body to their lab and extract the brain to use in a cyborg. It usually goes as expected, but if the body just isn't good for cloning/re-animation/robot conversion...well, expect the Chef to be busy. And don't be surprised if Robotics suddenly has a few new...decorations. There is no vent. Good thing corpses don't give off noxious gases when they decay in this game. The APC for this room is near the entrance into the maintenance roam, near the table. Morty the Possum's Mortuary Practice and Pizzeria. This pristine white room left of Robotics is the Morgue. In theory, corpses are supposed to be stored for forensic examination and revival. Hence, the box of body bags for transporting corpses, the scalpel & saw on operating table combo for extracting bullets, the bottle of formaldehyde for preserving corpses, and the forensic scanner for, well, doing forensics. 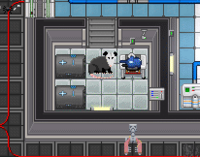 In practice, however, the corpses just go straight to (and pile up in) either cloning or robotics, so this is really just a home for Morty, the station's local Virgina possum. He's a sensitive but resilient kind of guy; try not to scream around him or take the meatball pizza he's guarding. He takes his job of managing sudden autopsy snack breaks quite seriously. There is no vent. Morty doesn't need vents. Neither does pizza. The APC for this room is near the top right section, near the table. 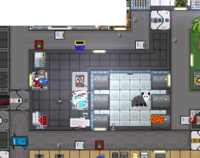 This rather uncannily pristine white room below Medbay Hospital's cryomedicine area is a Morgue, a storage area for dead bodies. 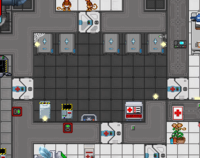 Since Medbay Hospital goes to great lengths to ensure that the deceased are cloned and/or roboticized, this room has a rather small footprint and doesn't have much more than a bottle of embalming fluid and two morgue units for preserving corpses, a hand labeler to denote the state of said corpses, and an evidence box for storing any bullets or small clues found on said corpses. It does, however, have Morty, a cute and adorable Virginia opossum who works as the Chief Sanitation Officer. Don't try to scream too much around him; he's a sensitive but resilient guy. There is no vent. Possums don't need vents. The APC for this area is on the bottom right wall. For some reason, it's labelled "Medbay", even though it doesn't control the whole hospital area.